14:11– The concentrating tables make the first reparation of metal from dross. The concentration or valuable ore pass over and – the dross is watched over the ride. 14:37—The concentration pass to the settling tanks. The rejected ore is carried into a tube mill and ground very fine. 15:02—Very fine ore is carried to first floatation unit, oil, and sulphuric acid are added, and the mixture churned into froth. 15:20—The valuable ore is coated by the oil and floats to the surface into bubbles. 15:36—The remaining ore settles to the bottom and is drown into second unit where it is again churned up and the concentrates removed. 15:54—This process is followed through ten similar units. Finally, the middlings are returned to the head of the system—tailings go to dump. 16:42— these concentrates also fine green ore from the mines and valuable flue dust from the blast furnaces are fused together in sintering plant. 16:58—Cars of concentrates, fine ore and flue dust are emptied into bins at top of sintering plant. 17:24—Gates measure correct quantities onto endless belt carriers. 20:18—Loading high grade green ore, sinter, coke and limestone onto furnace charging cars at bottom of storage bins. 21:01—Charging one of the four great furnaces each unit with capacity of 750 tons daily, 4 ½ % metal value. This process is constant. 22:31—Lower section of blast furnaces and water jackets. 22:42: Air pressure pipes—exhausts stack—and passage way from storage bins to smelter. 23:01—22 tons of valuable ore dust is collected in these flue bins daily. 23:20—Flowing at a temperature of 900 to 1050 degrees molten medal is constantly pouring into settler. 23:43—The Settler. The limestone added in furnace charge has heated the iron and rock making it fluid, being lighter this dross rises to the surface in settler and constantly pours off in the form of slag. 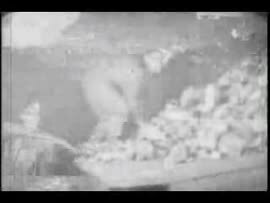 24:22—Slag pots, each holding 40 tons being emptied on the slag dump. 26:13—Let us return to the settler. The ore enters the settler—4 ½ % nickel copper from the furnaces. The iron and rock flow off the top as slag. 26:30—The nickel, copper, and some iron gravitate to the bottom and are drawn off at intervals in great ladles. This furnace matte is 16% nickel copper. 27:07—Lifting fifteen tons of molten metal from settler to the magnesite brick lined converters. 27:46—To this molten mass is added silica quartz from Bruce Mine as a flux. 28:50—As ore and quarts are added and slag drawn off, nickel copper deposit gradually rises in convertor to 45 or 50 ton weight when 80% copper nickel called 80% Bessemer Matte is drawn off and poured into moulds. This film is also available in DVD format. Retired INCO miners Jim Dufour and Jack Gingras provided commentary for this silent film in November 2011 to help explain to researchers at the archives what was happening in the film. This commentary is available on the DVD copy of the film. Video was originally on 16mm film and was transferred to VHS by Jim Durfour. The 16mm film the copy was made from was then distroyed.